Bentley and Penguin have teamed up to offer Bond fans a special edition of Sebastian Faulk’s upcoming Centenary Bond novel, Devil May Care. Released the same day as the regular editions, there will only be 300 copies of this printed and if you’re looking to get one, it’ll set you back £750 ($1500). Evoking the feeling of the Cold War period in which Devil May Care is set, the edition is bound in Bodoniana style cases and finished in burnt oak leather sourced from the tannery in Italy which provides the hides for Bentley’s interiors. The iconic Bentley diamond pattern found on the radiator grille and upholstery of modern Bentley’s, is hand-stitched on the leather casing and the front cover and spine is finished with the silver Bentley ‘Flying B’—the radiator cap of the Bentley’s of Bond’s time. The inside of the casing is trimmed in deep red hotspur leather and has the striking fluting used on the 1950s and 1960s Bentley interior upholstery. 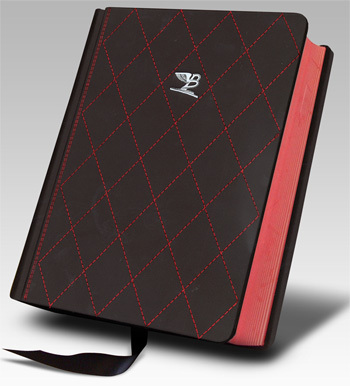 Each book has a unique edition number embossed on a black aluminium plate produced the same company that makes the Bentley engine plates. Fleming described in detail a modified Bentley R type in Thunderball and On Her Majesty’s Secret Service which Bond loving called ‘the Locomotive’. The car never existed but, using Fleming’s exact specifications, a cast and polished 1:43 scale model of the car has been hand crafted by Bentley for this edition. The miniature is inserted into the book in a car-shaped hole and is individually numbered to match the plate on the inside cover. Each book is protected by a custom-made Plexiglass slip case, which will be sealed in protective and numbered wrapping. For more information, check out the official Bentley/Penguin site here. There you can also read a brief history of Bond and Bentley, though they omit Bond’s “British Racing Green Bentley Mulsanne Turbo” from John Gardner’s Role of Honour. Of course, obviously the site is catered specifically to Fleming’s Bond. CommanderBond.Net also has a Q&A with Bentley’s Chief Designer, Dirk van Braeckel. Read it here. Also watch the video.